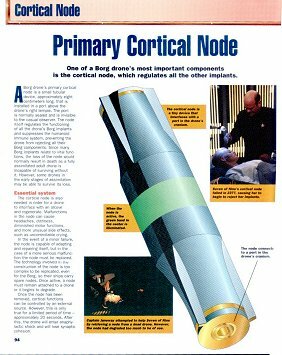 A Borg drone's primary cortical mode is a small tubular device, approximately eight centimeters long, that is installed in a port above the drone's right temple. The port is normally sealed and is invisible to the casual observer. The node itself regulates the functioning of all the drone's Borg implants and suppresses the humanoid immune system, preventing the drone from rejecting all their Borg components. Since many Borg implants relate to vital functions, the loss of the node would normally result in death as a fully assimilated adult drone is incapable of surviving without it. However, some drones in the early stages of assimilation may be able to survive its loss. The cortical node is also needed in order for a drone to interface with an alcove and regenerate. Malfunctions in the node can cause headaches, dizziness, diminished motor functions, and more unusual side effects, such as uncontrollable crying. In the event of a minor failure, the node is capable of adapting and repairing itself, but in the case of a more serious malfunction the node must be replace. The technology involved in the construction of the node is too complex to be replicated, even for the Borg, so their ships carry spare nodes. Once active, a node must remain attached to a drone or it begins to degrade. Once the node has been removed, cortical functions can be controlled by an external source. However, this is only true for a limited periods of time - approximately 20 seconds. After this, the drone will enter anaphylactic shock and will lose synaptic cohesion.